Picture above taken during the Parkside Players production of "Cocoanuts" by my friend Valerie. 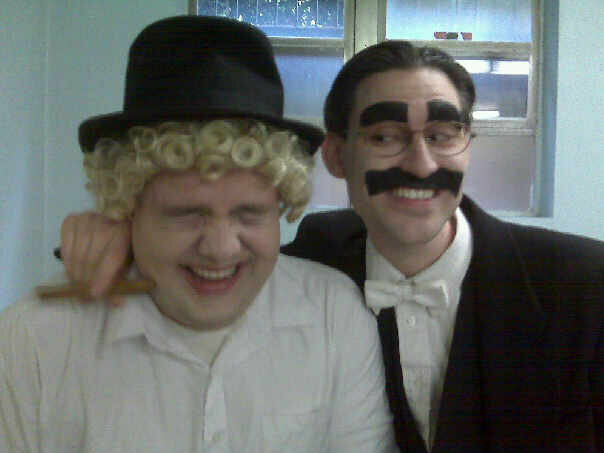 Pete is Harpo and that is me as Groucho "Schlemmer" Marx. I won the 2008 Josephine Foundation Award for Best Actor after playing this part. Please keep your limbs and possessions inside the car at all times and do not attempt to leave until the website has come to a complete and total load. You can send me mail at BrwyDevil@aol.com for any reason whatsoever. I enjoy hearing from you! Well... almost all of you. This site was created on January 14,2001 at 3AM - I will be updating it when something happens. Or if I get really bored with whats here. Over a decade in operation! Oh to think of the dozens of souls I've influenced in these pages... TO THINK! I have several pic pages that get updated whenever I see a pic I like, actually get it scanned and figure out how to put it on the site. I got a complaint recently that my face will never be forgotten because of the multitude of self portraits present on the site... I thought it was so sweet for someone to notice. I have added a few more pictures of myself to insure the image sticks around as long as possible. I have Musical Pages which have complete lyric access and some thoughts of the musical with pictures from time to time. The writing pages, quote pages and resume page are part of my creative expressions and exposure on the internet. They are the things I share with friends and the experience I have from the world.